Are you interested in an item but need more information? 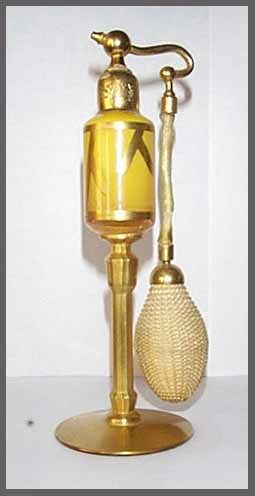 Click on Purchase An Item button to send us an email with your questions and or purchasing needs. Thank you! Hailing from Czechoslovakia this vintage lady dates from the 1920's. 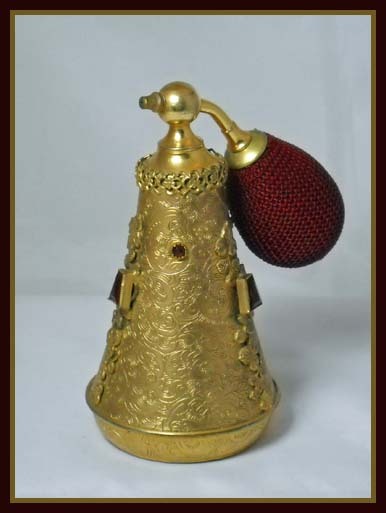 This unusual DeVilbiss perfume atomizer stands 6 1/2" tall. Pale Pink in color, with etched decorations consisting of frosted spheres with etched lines intersecting them. It reminds me of Olives on a Pick, Martini Time! 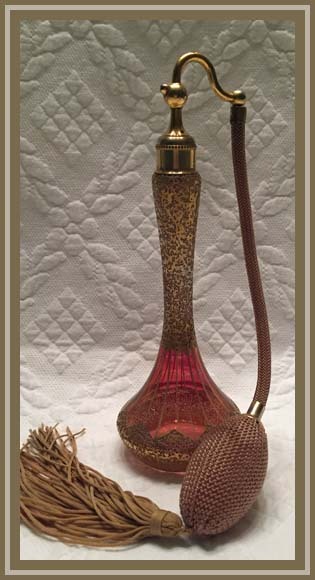 In excellent condition, this VINTAGE Art Deco inspired perfume atomizer would look fantastic on your dresser tray. 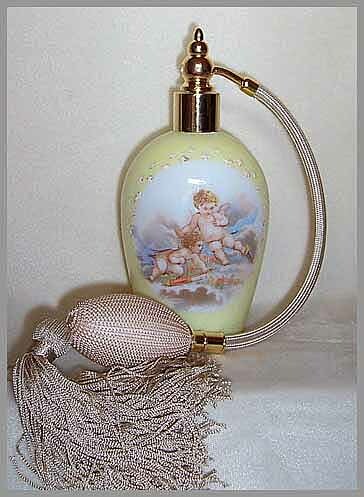 This gorgeous DeVilbiss perfume atomizer is from my personal collection. 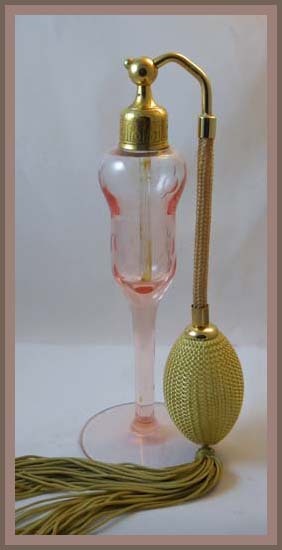 This PINK DeVilbiss perfume set is from my personal collection. 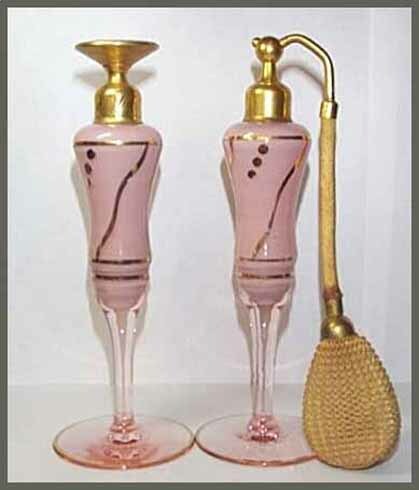 The bottles are Pink with Gold dots and lines as their decorations. 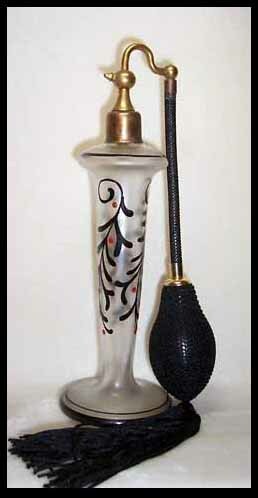 The perfume atomizer is 6 1/2" tall and retains the original siphon, ball and cord. 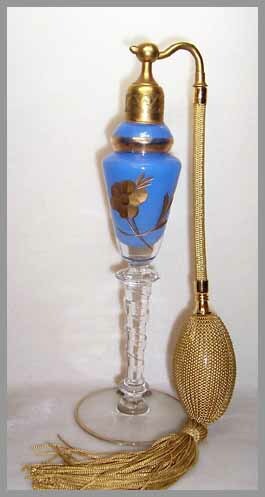 The perfumer is 6 1/4"tall, the stopper has an Opaque Pink top, the glass dauber, and is without damage. 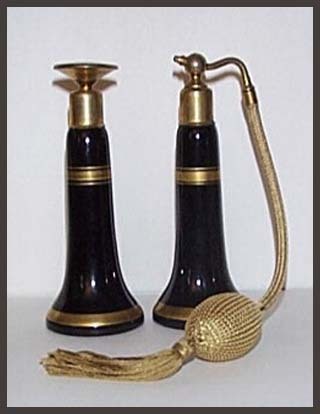 This vintage perfume set is so glamorous! 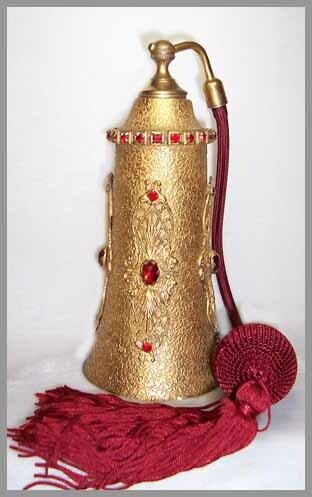 It would be gorgeous addition to your collection. 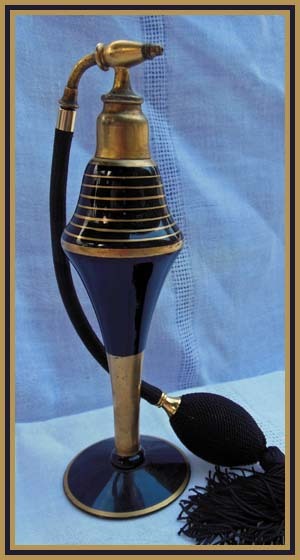 This ART DECO inspired DeVilbiss atomizer will take your breath away. us by clicking on the SPECIAL REQUEST button below. We prefer Paypal or a Cashier Check as our methods of payment. We ship Priority Mail, with Insurance for the full purchase price & tracking numbers for a $15.00 fee (U.S. only - International rates vary). 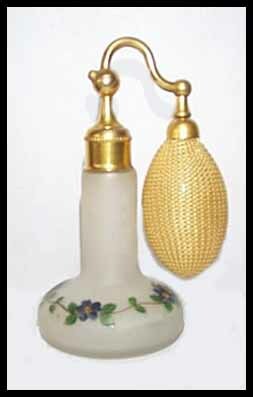 We are currently working on the images of our beautiful antique Czech perfume bottles, Vintage perfume atomizers, and Mini perfume bottles for all collections. 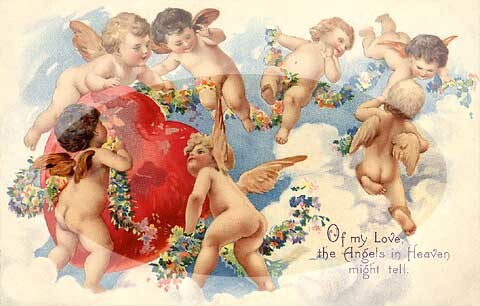 Please check back to see our new items during the month of April. add text.